It is time for another palette at the colourQ! Hoping to get back in the saddle again after what has been a really short, long summer. I have been a bad blogger the past couple weeks just too much going on. Now I have pretty much missed this past weekend for commenting and I just have to face the fact that I am not catching up, so let's start again. 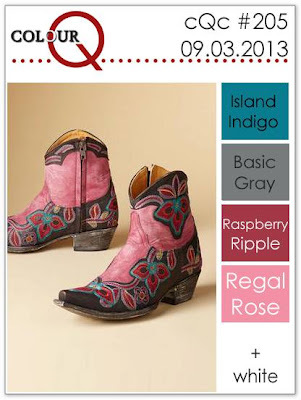 Lovely rich tones again this week and a pair of boots that I have got to have! A die cut card this week using that fantastic Fanfare die from Lil' Inkers and this week's colours. 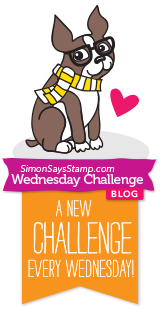 I am also submitting this card to the Simon Says Wednesday Challenge Anything Goes. The rich color tones are amazing...I love the texture in the scallops. Beautiful use the die and colprs! Beautiful use of the die and colors! What cool dies!! Stunning card! Gorgeous scallops and a great take on the colours! Very pretty way to showcase these cards! Yep you just have to accept that you just move forward on the comments...it's just to hard to backtrack . What a gorgeous card. I love that die and really need to use it. 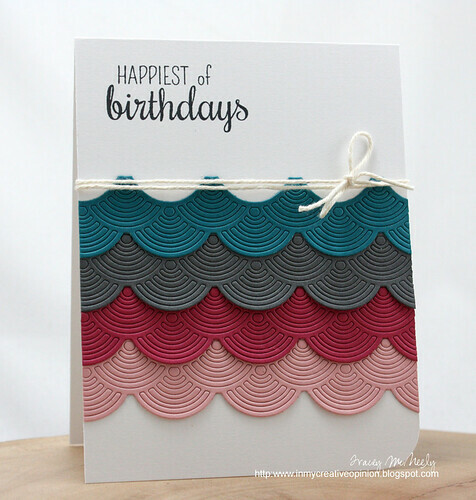 A great die and great colors - you've put together a simple yet totally cheerful card!! This is just fabulous. The moment I saw it I thought--this is the card I wish I made. What a perfect way to use those gorgeous colors. I hope I get a chance to play this week, but I guess I will have to think of something else. Wow! What a fantastic card! I adore those fanfare layers. I'm seeing a new die that I "need" to have! 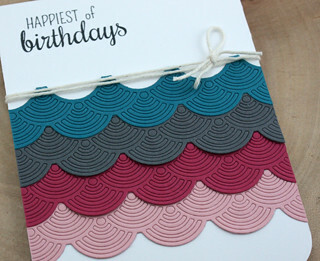 Love how you used the colors ~ that fanfare die cut is fantastic! Oh, this is gorgeous! I love these colours together! Amazing card Tracey...as you can see I just about caught up on my blog comments. I love, love, love this card! That die is to die for and what an amazing way to so happy birthday! I love those gorgeous scallops, Tracey! Such a lovely card! And I know what you mean. Mi feel like I'm ALWAYS behind on my commenting!